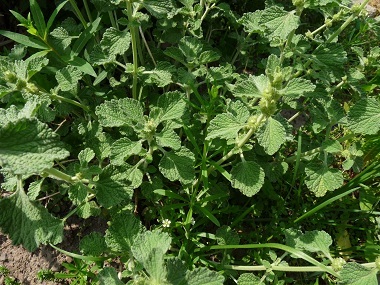 Horehound is derived from "Horus", the Egyptian god of sky and light. For centuries, herbalists have prescribed this edible weed for fevers, malaria and especially for coughs. This is a perennial plant known more for its medicinal purposes than a food source. Although horehound can be consumed, it is highly recommended that this is not done on a regular basis, only once in awhile. Horehound as occasional food or as an herbal remedy is not to be taken during pregnancy or while nursing. Higher consumption can cause cardiac arrhythmia or an irregular heartbeat. In larger quantities horehound may also cause diarrhea or an upset stomach. Distinguishing Features: Horehound is a bushy plant producing numerous annual, quadrangular and branching stems. It grows between 30 and 40 centimetres in height and has unique crinkled leaves that emit a bitter scent. Blooming season can range from April to October depending on geographic location and flowers do not appear on this plant until its second or third year. Flowers: Horehound flowers are white and are spiral-like positioned in the space between a leaf or branch and the stem. Its does not appear on the plant until the second or third year of growth and blooms anywhere between April and October. Fields of Nutrition has medicinal benefits and vitamin/mineral content of Horehound. Leaves: Horehound leaves are unique as they are wooly and whitish-gray in colour and crinkled-looking. They have an extremely sharp aroma when crushed. Height: Horehound generally grows to heights of 30 centimetres but depending on geographic location, it can grow taller. Habitat: Horehound is a hardy wild edible plant that grows easily. It tends to do well in dry, well-drained soil, but adapts to most conditions. The horehound plant will survive with little moisture (about 30 cm. of annual rainfall) and it thrives in full sun. It grows along roadsides, in disturbed areas, fields and in semi-dry areas. Edible parts: Aerial parts are used. Leaves and the flowers can be added into a salad, stir-fry, soup or stew but only once in awhile. This is a plant that is not intended to be consumed as food on a regular basis. This is used more in herbal remedies to help eliminate occasional maladies. It is an immune booster so drinking a cup of horehound tea once a week can be beneficial. It tastes very bitter so adding honey to sweeten is recommended.